Although the notion that entrepreneurship benefits society has attained broad currency in Latin America and elsewhere, confusion reigns: Latin America’s leaders variously promote entrepreneurship as “self-employment”, and regularly talk of “start-ups”, “disruptive business”, “small businesses” and “micro-enterprises”. No wonder a recent World Bank article on Latin America bemoans that “entrepreneurs’ lack of innovation curbs creation of quality jobs”. Even respected institutions like the World Bank confuse small business, innovation and growth. In reality, some of these “entrepreneurships” contradict each other: research shows big firms, not small ones, are more innovative. Media hype notwithstanding, “disruptive start-ups” as a coherent concept just doesn’t produce the goods. A 2015 World Economic Forum report shows that highly competitive countries have less start-up activity, not more. Latin American countries in particular shine in new business creation, but lack luster when it comes to competitiveness. For entrepreneurial activity to translate into economic growth, we need to focus less on the “start” and “small” side of things and more on how those companies of all ages, sizes and sectors scale. Why? Because research (see here, here and here) clearly shows that it is relatively high-growth firms – what we call “scale ups” – that are the real generators of jobs, taxes and wealth. Contrary to the myth, small businesses and start-ups only generate these benefits if they then go on to grow. And historical perspectives on the growth of entrepreneurship from Israel to Bangalore to Silicon Valley shows that the critical path to prosperity paradoxically goes from scale up to start-up, not the other way around. 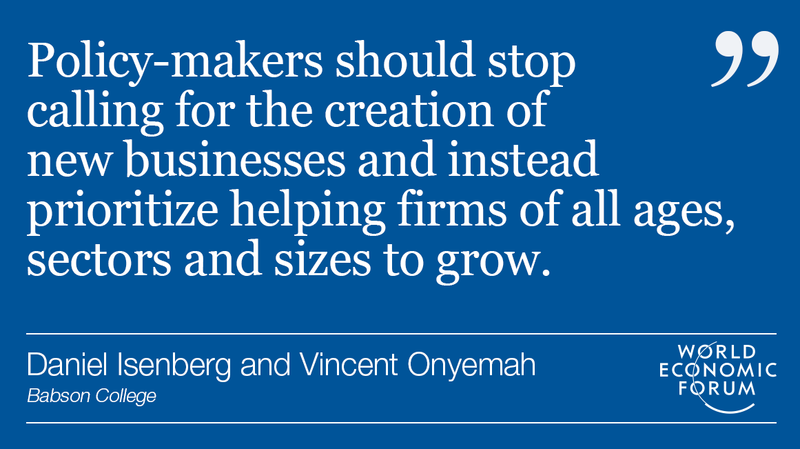 Policy-makers should therefore stop calling for the creation of new businesses and prioritize helping firms of all ages, sectors and sizes to grow. There’s ample evidence that when they do so, it helps more than just the businesses in question – it also spreads prosperity deep into the community. Consider the case of Manizales, a 400,000 low-middle income city in the Colombian coffee district that collapsed in the 1980s, spreading unemployment and discouragement, a sadly familiar story in many countries. Since 2012 dozens of city leaders, hundreds of professionals and educators, along with many thousands of citizens have been focusing their attention and energy on helping local firms grow more rapidly. With the hands-on professional guidance of the Babson Entrepreneurship Ecosystem Project, 71 companies in five cohorts have grown by about 35% each (as of March 2016), so far directly creating 1,291 new jobs and 1,451 new contracts; 12 of the ventures became exporters for the first time. Because Manizales-Mas – the name given to this entrepreneurial project – first focused on existing firms with growth potential, it only took a year to see the first growth impacts, for example, in new exports. In four years, the number of jobs directly created by Manizales-Mas, leaving aside unmeasurable spillovers, is greater than the increase by the city’s biggest employer. Dozens of the city’s top executives and professionals were in parallel trained as business mentors, and 42 of them have been extremely active in helping entrepreneurs scale their businesses. For example, with intense Babson training and close consultation by a team of mentors, in one year Maquiempanadas’s CEO, Emma Mesa, tripled its exports to Central and North America. Maquiempanadas, an industrial manufacturer of empanadas and arepas making equipment for restaurateurs, went on to win the national award for best exporter. Investors from Medellín and Bogota have taken notice, and two years ago made the city’s first private equity investments. After seeing the media attention and impact of Manizales-Mas, Babson helped the local universities get together to develop new jointly offered entrepreneurship courses and start-up programmes. Not to be left behind, local bankers increased their loans and lines of credit to take advantage of the growth, while creating banking seminars to help entrepreneurs be more financeable as they increased their growth. Rather than being restricted to an elite, the changes in Manizales are beginning to seep into local culture, as several independent surveys demonstrate. When asked whether they were proud of their city, 82% of respondents in Manizales said yes in 2012; by 2016, that figure had increased to 91%. Over that same period, Medellín, for example, saw a decline from 80% to 79%. Bogota saw a smaller increase in pride from 46% to 50%. Looking at another measure, Michael Porter’s Social Progress Index of cities in Colombia ranked Manizales number 1 among the 16 largest Colombian cities, and the “ease of creating a company” in the city increased by 140%. When we spoke to investors from Medellín, they told us that Manizales’s obsessive focus on growth and systematic support for scaling up reduces their risk of investing in Manizales companies by at least 2%. So what lies at the heart of this scale up method, and what can other cities in Latin America and beyond learn from it? To help regional leaders experience and support rapid growth, we have developed a proprietary methodology we call the Scalerator®. Its innovation lies primarily in its simplicity and focus: six months of intensive learning, practice and mentoring on the three “primary colours” of scaling up: customers, capacity and cash. Participants are selected only on the basis of their ambition to grow, with some tangible prior indication of market acceptance. The Scalerator is age and sector agnostic – the entrepreneurs themselves and their markets will determine what grows and what stagnates. If growth happens and no one knows about it – like the tree falling in the forest – it does not have a broad community impact. As more and more companies start to experience tangible, quantifiable growth (“We won a $50,000 export contract to Ecuador and hired three people”), we train the entrepreneurs and all the people around them to recognize growth and talk about it. It might sound simple – and it is in fact easily taught and learned – but it doesn’t come naturally to many people. The good news is that most people from across the entrepreneurial ecosystem – public leaders, corporate executives, educational directors, bankers, journalists, economic development professionals, and even religious leaders – have a natural stake in local growth, even if they think about it and benefit from it differently. So, using a simple map of the entrepreneurship ecosystem, we systematically train the stakeholders in how to invest in growth in terms that are meaningful and beneficial to them. For example, we trained the bankers in Manizales to understand entrepreneurs, and then invest in training programmes on how to be bankable, resulting in numerous new financing opportunities that improve the banks’ loan portfolios. The “Manizales Model” is being applied to diverse environments, part of a new groundswell Scale Up Movement that’s already at work in Milwaukee, Rio, Denmark, Russia, the UK, Panama and Ohio. The Manizales-Mas case has been taught at Harvard, Babson, and other institutions. 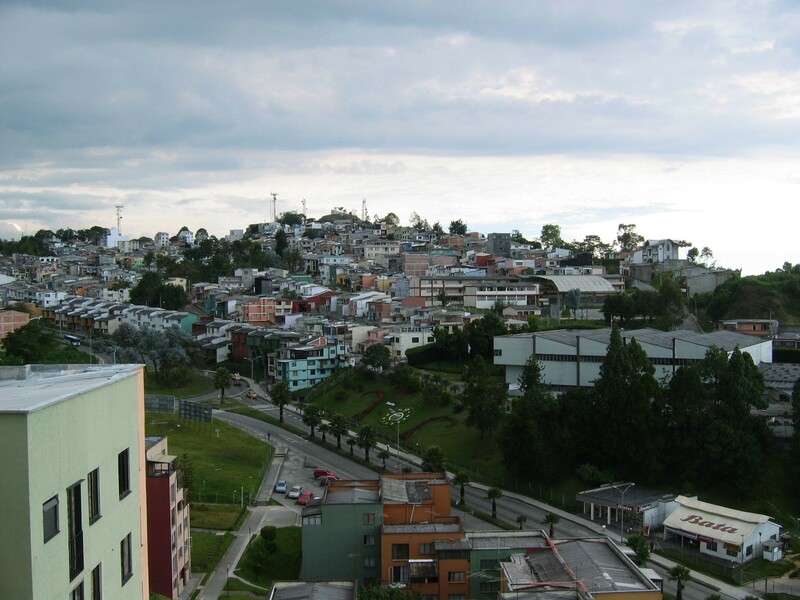 One of the model’s strengths, and the fact that it has been implemented so comprehensively in Manizales, Colombia, is its applicability to normal urban and semi-urban environments throughout Latin America as well. Who knows: it could be coming to a city near you very soon.